It’s nearly the end of this long referendum campaign. If you’re still an undecided voter, or wavering about your choice, or if you know someone who is either of those things, I’d like to set out the arguments why I believe you should vote to stay in the European Union. I’ll start out by setting out the case for a Remain vote, then discuss the counter-arguments made by the Leave side. In my view, there are a series of reasons to stay in the EU: economic benefits, security, workers’ rights and the environment. I’ll take each of these in turn. EU membership gives the UK access to the world’s biggest market, plus 50 more countries which the UK has trade deals with via the EU. It might be possible to renegotiate that access from scratch if we left the EU – but it might not. Why take the risk that it isn’t? The only way to guarantee market access to the EU and 50 other countries is a vote to Remain. So it’s no wonder that the large majority of British businesses support the UK’s EU membership, and are worried about their prospects if we vote to Leave. Loss of that guaranteed market access wouldn’t just affect those whose jobs are linked to trade with the EU. It would also affect the broader economy, due to the impact on investment and because the government would have less to spend on public services in a smaller economy. Many people are suspicious of economic forecasts. But the risks of a Brexit vote have already manifested themselves in the last few weeks. The value of the pound and stock markets (which include pension assets) dropped when a Leave vote seemed more likely, and increased again when the odds of a Remain vote went back up. There are reports of capital flight from the country. There’s surely a reason that the Bank of England has drawn up crisis plans in the event of a Leave vote – but no such plans in the event of a Remain vote. Let’s look further at those economic forecasts. It’s true that many forecasters failed to predict the 2008 crash. But one who did, Nouriel Roubini, has also warned of the economic effects of a Leave vote. And the forecasting record of the few economists on the Leave side is not great either: Patrick Minford predicted that the UK would lose millions of jobs when the minimum wage was first introduced. And Patrick Minford argues that Brexit can only work if the UK mostly eliminates manufacturing – hardly a pleasant prospect for British workers in manufacturing jobs, and their families and communities. EU membership comes with a host of laws regarding police and criminal law cooperation. As I discuss here, those laws have helped the UK get hold of far more fugitives for trial in the UK, and also remove more criminals for trial abroad. The amount of data exchanged between police services on alleged terrorists or other criminals has increased too. Moreover, the UK’s justice system is not threatened by EU law in this field: we have an opt-out which the government has frequently used. Countries outside the EU have access to only a small fraction of these EU measures, and there would be legal complications if the UK sought to renegotiate access to police data exchange after Brexit. There’s clear proof of this – even a non-EU country like the USA has faced repeated legal and political challenges trying to obtain such access in practice. Again, the only way to guarantee being part of these laws is a vote to Remain – while a vote to Leave would remove the UK from much of this cooperation between police and prosecutors. Despite some attempts to deny it, it’s clear (as I discuss in detail here) that EU laws have increased the level of protection for workers’ rights – including equal treatment of women in the workplace – above the level it would otherwise be in the UK. 60% of EU cases involving equal treatment of women in the UK, and 62% of other EU cases involving workers’ rights in the UK, have led to increased protection. These rulings have improved rights as regards (among other things) pregnant workers and maternity leave, equal pay for work of equal value, paid holidays for more workers, and the protection of occupational pensions when an employer goes broke. 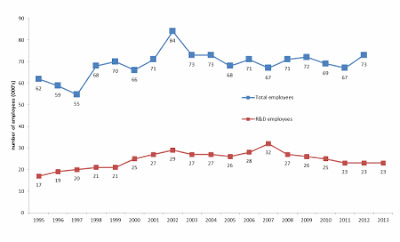 It’s no wonder that the large majority of trade unions support the UK’s EU membership. Many senior figures on the Leave side have explicitly admitted they want to scrap these protections. Indeed, Nigel Farage says that women who have had children are ‘worth less’ to their employers. So, again, the only way to guarantee these rights is a vote to Remain. A Leave vote would risk the future of these employment and equality law protections, by putting their fate in the hands of people who are implacably opposed to them. There is a raft of EU laws protecting the environment: from air pollution, to clean beaches, to nature protection, among many more. It’s no wonder that the Green party and environmental NGOs support the UK’s EU membership. On the other side, the pro-Brexit environment minister has admitted that there are many EU environmental laws he would scrap in the event of a Brexit. The businesses backing the Leave side have drawn up a hit list of dozens of environmental laws they want to rip up. So, again, the only way to guarantee these rights is a vote to Remain. As with workers’ rights, a Leave vote would hand over environmental protection in this country to those who have admitted their intention to reduce protection. What about the case to Leave? What are the risks to Remain? The Leave side have argued that there are a number of risks to remaining in the EU. As I point out in detail here, these arguments are unfounded. The UK has a veto over tax laws, defence, foreign policy, future enlargement of the EU, the basics of the EU budget (including the EU rebate), trade deals with non-EU countries (including the controversial planned ‘TTIP’ deal with the USA), and transfers of powers to the EU. Turkey is not about to join the EU: it has agreed only one out of 35 negotiating chapters in 11 years of negotiations. The UK has an opt out from the single currency, bail outs of Eurozone states, joining Schengen and EU asylum and criminal law. You may not trust British politicians to keep these safeguards. But in the large majority of cases, it’s not up to them to decide on that – it’s up to us, the voters. British law already says that in the case of any transfer of powers to the EU, including the creation of an EU army or joining Schengen or the single currency, another referendum would be needed to approve the decision, as well as our government and parliament voting in favour. Is there an economic case to leave the EU? It’s true that the EU has common rules on trade with non-EU countries, so the UK would in theory be able to sign separate trade deals with those countries where the EU has not done a deal yet. The problem is that this theory would be hard to put into practice. As discussed in detail here, the UK would have to start from scratch negotiating trade deals with those non-EU countries which already have a trade deal with the UK, via the EU. (These include the majority of Commonwealth countries, as I discuss here). Some of these EU-wide trade deals are very advantageous to the UK – for instance our exports to Korea have hugely increased since the EU trade deal with that country. The head of the World Trade Organisation has also warned that this would be a difficult task. In the meantime, the UK would have to renegotiate access to its largest trading partner – the EU. It’s true that both sides would have an economic interest in such a deal. But nevertheless, trade deals take years to negotiate, either with the EU or non-EU countries. There are plenty of cases where a deal is never struck at all, despite the economic interests on both sides. Moreover, the Leave side say they want a free trade deal with the EU, not continued participation in the EU’s single market. That doesn’t bode well for the UK’s trade with the EU after Brexit, because (as explained here) a single market gives better access to services markets – and the UK has a big net surplus in services exports. 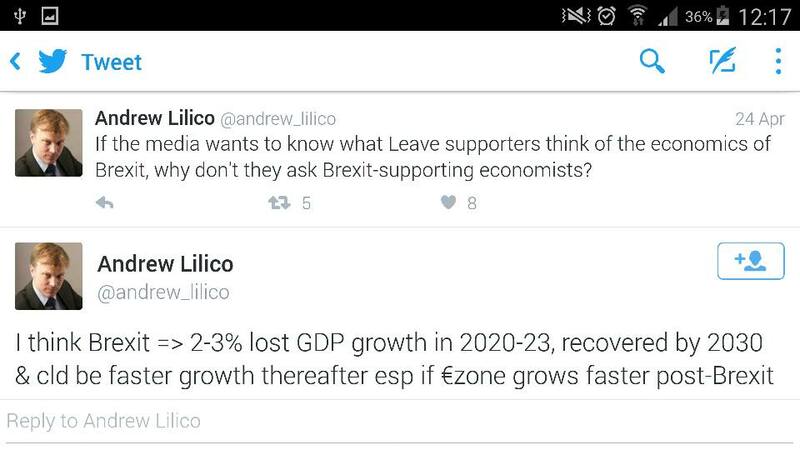 When asked about economic issues, those on the Leave side have often said ‘I don’t know’ or ‘so what’. Some have expressed indifference to a negative impact a Leave vote might have on the economy, or said that an economic downturn is a ‘price worth paying’ for leaving the EU. A good example of this attitude was Nigel Farage’s attitude in one of the debates to the pharmaceutical industry – a huge UK employer (see the graph) with big net exports to the rest of the EU. He was indifferent to what might happen to this industry if the UK left the EU, referring to the UK’s ‘domestic market’ and ‘alternative medicine’ instead. While Boris Johnson has promised to apologise if leaving the EU causes a recession, that would be cold comfort to anyone losing their job. 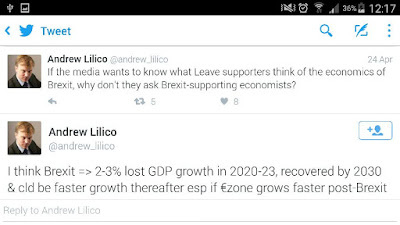 The Leave side has no coherent economic plan for what happens after a Leave vote and appear indifferent to the prospect of economic loss if we leave. That amount of money will not save the NHS or end austerity. Anyway, as the independent Institute of Fiscal Studies has pointed out, even a small drop in economic growth as a result of Brexit would have a much bigger impact for the UK government’s budget – and therefore taxpayers – than the UK budget contribution to the EU. 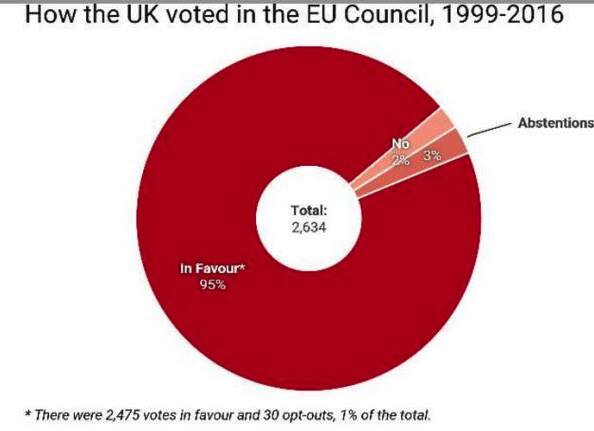 As for the proportion of UK laws which come from the EU, the House of Commons has estimated that it’s only 13%. That doesn’t include EU regulations, but as pointed out here, most EU regulations aren’t laws in the ordinary sense, but administrative decisions. So if you counted also all the administrative decisions made in the UK as well (like every approval of longer pub opening hours, or home extension), the proportion of British laws coming from the EU would still be small. Anyway, the key test for sovereignty is not the percentage of UK laws that come from the EU, but the percentage of UK laws that were imposed on the UK against our will by the EU. It’s ridiculous to say that UK laws which were already on the books, or which we agreed to change at the same time as other Member States, are an invasion of sovereignty. Applying this test, since the UK voted for 95% of EU law, the percentage of UK law imposed against the UK’s will is only 5% of those 13% of national laws which come from the EU – or 0.65% of the statute book. Even if you believe the claims of some on the Leave side that 60% of UK laws come from the EU, the percentage of our laws that were imposed against our will by the EU would only be 3%. So the sovereignty issue has simply been hugely exaggerated by the Leave side. EU law does govern the number of EU citizens who come to the UK. But they can’t stay unless they have a job or are self-sufficient. The UK can (and does) deny them social benefits until they have worked here for a time; and the UK’s renegotiation deal will allow us to deny them key in-work benefits as well. The UK can (and does) expel or refuse entry to EU citizens who pose a security risk or who have a criminal record too. Non-EU citizens do try to enter the UK from the EU, but they would do that even after Brexit, since it wouldn’t alter the law in any way on this point. In fact, after Brexit the UK would no longer be part of the EU’s Dublin system for sending asylum-seekers back to other EU countries, so in some respects migration control would be harder, not easier. There’s a clear trade-off between EU migration and the economic benefits of EU membership. As the Leave side points out, countries like Norway and Switzerland are wealthy outside the EU. 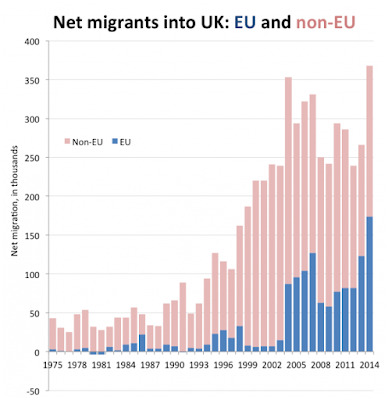 But they’ve also signed up to free movement of people with the EU, and have a greater share of migrants in their population than the UK does. Is there a left-wing case to leave the EU? Some on the left-wing side of British politics believe there is a left-wing case to leave the EU (a so-called ‘Lexit’). There’s an obvious flaw in their logic: there’s no ‘Lexit’ box on the ballot paper. A Brexit vote tomorrow would not deliver a left-wing government to office. Rather, as Owen Jones, Paul Mason and George Monbiot have pointed out, it would shift power to those on the right wing of the Conservative party who favour austerity and loathe the NHS. Although, as noted above, those same people have announced their intention to scrap environmental and employment laws after Brexit, Lexit supporters plan to rely on the kindness of Tories to protect those rights. Never in the course of human history have so many left-wingers had so much faith in their traditional opponents – with so little reason to do so. 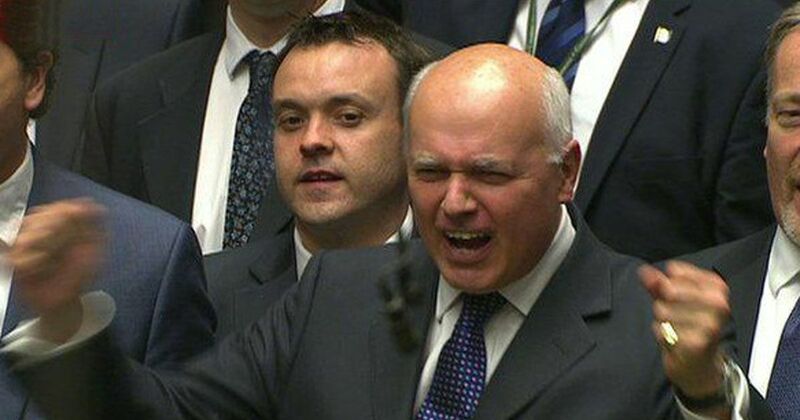 If you want a vision of the future after Brexit, imagine Iain Duncan-Smith fist-punching – forever. Of course, the UK has many problems. But the question is, which of those problems would actually be solved by leaving the EU? 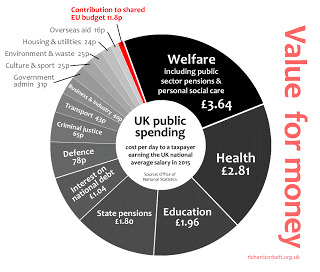 Our EU contribution accounts for 1% of public spending, and EU laws which we didn’t vote for make up a tiny proportion of our statute book. Rather, it was our government that decided to implement austerity cuts. Our government decided to reorganise the NHS. Our government brought in a bedroom tax, and planned cuts to disability benefits, while cutting income tax for high earners. Our government nearly tripled university tuition fees (in England). Our government reduced trade union rights, hiked industrial tribunal fees, and encouraged zero-hour contracts – and sets the level of the minimum wage. Our government sets rates of income tax, national insurance contributions, inheritance tax and company tax, and controls what local governments charge as council tax. EU law sets minimum rates of VAT and excise tax, but the government voted for those laws (it has a veto on EU tax law), and anyway our government has set the rate of those taxes well above the EU minimum. Our government decides on how much to spend on pensions, on other benefits, on the NHS, on schools, on roads, on housing, and on foreign aid – on everything except the 1% of the government spending that goes to the EU. Our national debt stems from our government’s decisions on how much to spend, compared to how much to tax. Simply put, our government controls nearly every decision that affects the UK, including the majority of migration to the UK. There’s no point voting to Leave based on any of those decisions which are within our country’s control. The case to Remain in the EU is that it enhances our country’s strengths. Membership gives us a guarantee of trade with our largest market, and 50 other countries besides. It guarantees continued cooperation on policing and criminal law, and continued protection of workers’ and environmental rights. Outside the EU, there are no guarantees – only risks. The economic risks that trade and investment are reduced. The security risks that we have less cooperation with police and prosecutors in the EU. The social and environmental risks of fewer protections for workers and the environment. And this would all be for an illusory gain of sovereignty: when our EU contribution accounts for 1% of public spending; when we vote for 95% of EU laws; when at most 3% of our laws were imposed upon the UK against its will by the EU. In effect, the Leave side want to cut down a forest because they don’t like one tree. The best way to ensure economic growth, while retaining other benefits of EU membership, with only marginal impact on our sovereignty, is to vote to Remain in the EU. Excellent article, best work I have read during this debate. It's a shame that the remain politicians couldn't make these points last night on BBC. They were very poor if you ask me, and really missed the boat all bluster. If more people read this blog, the remain vote would be in the bag by now. 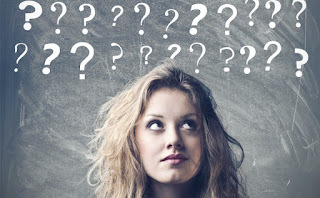 Nice read, one question. You mention EU regulations that are not necessarily laws. What kinds of things might they be? Thanks. Those would be things like the Regulations setting the daily price of fruit and vegetable imports. Interesting read. But, the EU needs to be involved in 'Regulations setting the daily price of fruit and vegetable imports' why? It's not regulating the retail price, it's regulating in terms of the common agricultural and commercial policy. Every country in the world has some sort of restriction on agricultural imports to protect their farmers.